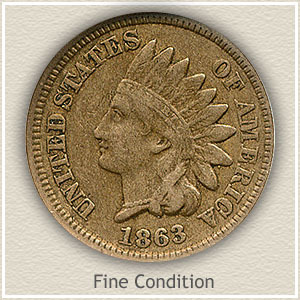 Collector demand is pushing your 1863 Indian head penny value higher. Extra value is placed on these special coins as part of the scarce Civil War years. Of note is the copper-nickel metal alloy used during the beginning years of the series. Your coin is a different color, noticeably heavier and thicker than later years. A popular date, sought after as part of the early years subset within an Indian Cent collection. The next step in finding an accurate value of your 1863 penny is judging the condition. Collectors and dealers examine the amount of wear to the surface and a "grade" is assigned. The ultimate in grade are the "uncirculated" coins, ones that were never used. Highest in value due to its outstanding condition the choice uncirculated 1863 Indian penny pictured is easily worth over $115. Just below the value chart are images and descriptions to compare your coin, giving you an idea of its grade. The importance of condition is represented with this 1863 penny. Under close examination there is no evidence of wear. Furthermore it is almost completely without any contact marks or abrasions. The color and luster is bright and full. Gem quality Indian pennies are rare and sought by collectors and dealers to enhance collections or inventories. Offered at a David Lawrence rare coin auction, multiple bids drove the price to $345 for this 1863 rare condition Indian penny. Known survivors in such a high state of preservation are few. When a choice or gem condition example is available they consistently sell in the hundreds of dollars. Small and subtle details often separate a slightly better $20 coin from a not quite as nice $10 example. Key elements of the design are used to judge the extent of wear to a coin’s surface. 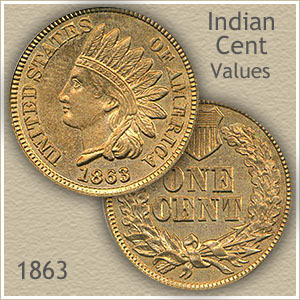 Images and descriptions uncover an accurate 1863 Indian head penny value. 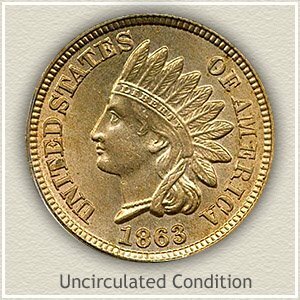 Uncirculated: For a coin to grade "uncirculated" and at the top of 1863 Indian head penny value no wear is present to its surfaces. Close examination is made to the ends of the feathers, hair and headband above her eyebrow and cheek and neck. These areas are the highest parts of the design and in the case of the neck and cheek, quickly show any wear. You are looking for a slight flattening to the normal roundness of the designs. Rotate the coin at an angle to you eye. Wear appears as a different color in the metal, compared to the surrounding non abraded surface. 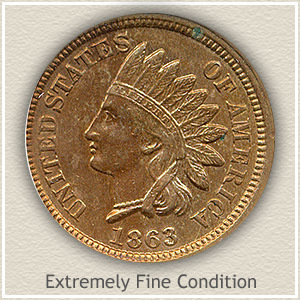 Extremely Fine: An 1863 Indian penny in "extremely fine" condition is well defined in all areas of the design. Boldly rounded and separated are the hair curls and headdress ribbon below her ear. The headband remains very detailed with every letter in "Liberty" complete and sharply defined. Overall a nice coin with some light wear that does not detract from its appearance. Good: Worn to a shallow relief with little detail remaining describes a coin in "good" condition. The area surrounding the eye is slightly defined. Just visible is a separation of chin and neck. The headdress and feathers are worn smooth showing just an outline. Although the lettering and date are heavily worn they should be separated from the rim. Your 1863 Indian head penny value may be at the low end of the scale but because of its history they remain an important coin. $1 to 2 dollars for common dates. With many advanced collectors pursuing Indian pennies the rare dates are rapidly moving higher in value. Better condition coins are especially sought. Your box of old coins has never been more valuable.